Katy Perry vs. the nuns: Real estate legal feud continues in Los Angeles. Sister Catherine Rose, left, and Sister Rita Callanan outside the Sisters of the Immaculate Heart of Mary Retreat House on June 25 in Los Angeles. The sisters say they were first informed in September 2014 that the archbishop planned on selling the property to a woman called Katherine Hudson. The nuns later learned that Hudson was better known as the pop sensation Katy Perry. After learning more about the singer and her “public image,” the sisters objected to selling Perry the property “for what should be obvious reasons coming from Catholic nuns,” the attorneys wrote. 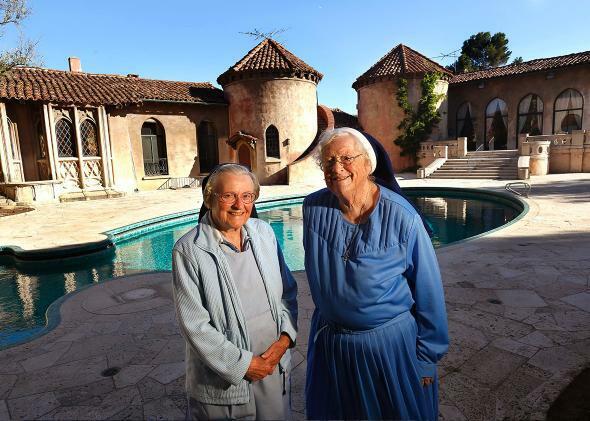 The two nuns would prefer the property be sold to a restaurateur and developer named Dana Hollister who may keep it open to the public in some capacity and who would pay the nuns directly. The local Catholic archdiocese wants to take Perry’s offer, which involves more cash up front—and which would involve paying the archdiocese rather than the nuns—and says that the nuns’ civil nonprofit does not have the right to decide who the property is sold to. A hearing on the matter is scheduled for July 30.